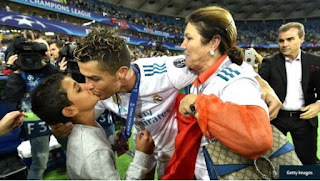 Ronaldo has hinted at a summer move away from Real Madrid and his mother would prefer a return to Manchester United over a switch to Paris Saint-Germain . Having helped the Blancos to a third successive Champions League crown, the Portuguese went on to refer to his time at the Santiago Bernabeu in the past tense . Transfer talk was immediately sparked, with Ronaldo offering contradictory messages regarding his future since then to keep the rumour mill ticking over . Few clubs would be willing to put a deal in place were the exit doors to be opened in Spain, with only those with the deepest pockets capable of pulling off such a coup. United and PSG would form part of that exclusive club and Dolores Aveiro has suggested to her son that a second stint at Old Trafford should be taken in if he really does want a fresh start. She told SFR Sport prior to Ronaldo’s exit hint in Kiev: “I like Paris. I go there now and again. “The last time was with my son when he won the Ballon D’Or. I felt very proud. “Every time I go to Paris, everyone treats me very well.